What is the definition of Distaff? Distaff is a device used in hand spinning in which individual fibers are drawn out of a mass of prepared fibers held on a stick (the distaff), twisted together to form a continuous strand, and wound on a second stick (the spindle). From seventeenth century England, the word distaff became a synonym for maternal, as most spinning was done by women in their homes. How does the Fixed Regiment of Spanish Louisiana define Distaff? Distaff are those individuals who provide non-military support for the regiment and include women, men and children. The Fixed Regiment of Spanish Louisiana, unlike the colonial American army, did not have campfollowers. Ladies in camp might be visiting a husband or other family member, be a local townsperson, be providing Sutler services or be the wife of an officer. With this in mind, ladies of the Regiment have a wide variety of choices for dress. 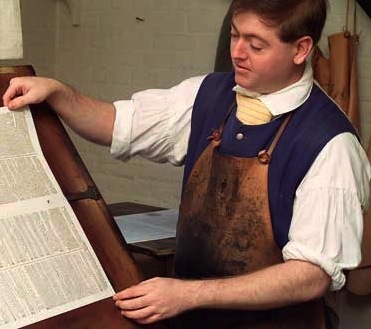 Undress in the 18th century refers to everyday, utilitarian working clothes, also referred to as common attire. White fine linen or cotton shift. Shifts have ¼” white cotton tape drawstring ties at the neckline and bottom of the sleeve. The shift should be somewhere between knee and calf-length, with three-quarter length sleeves that cover the elbow, and a neckline low enough to show the cleavage. Strapless stays. Stays are a lady's foundation worn over the shift and necessary to achieve the proper 18th century shape. Stays also provide back support. Stays can be back lacing only or back and front lacking. Back lacing stays need a second person to help tie the stays in place. 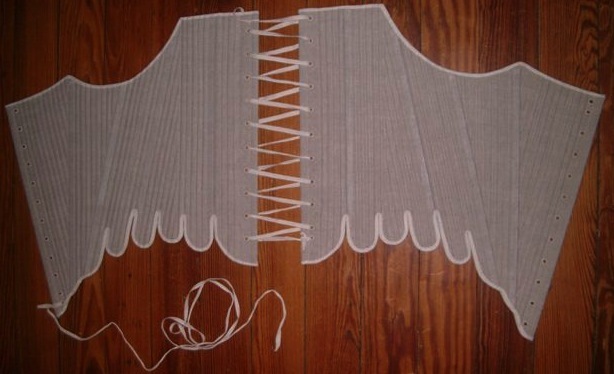 If dressing alone, it is recommended to spend the extra money for back and front lacing stays. Stockings. Stockings can be of any color, cotton, wool or silk. The simple choice is to wear plain off-white stockings. Silk stockings tend not to shrink or become stiff, making them more durable and more comfortable to wear. Black leather garters used under the knee to help keep stockings in place. Pockets. Pockets are worn tied around the waist either under or over petticoats. Pockets worn under petticoats are generally made of simple white linen and sewn to a white cotton tape. Pockets worn over petticoats are generally made of heavier fabric with embroidery applied on the face of the pocket. Linen Petticoats. A petticoat is an 18th century skirt. Undress petticoats are of simple construction, made from two 54" - 60" wide fabric pieces sewn together with a draw string waistband that ties about the waist. Nine inch openings are left from the waist down in the side seams for ease of dressing and to allow for access to pockets worn under the petticoat. Linen is used for authenticity and safety near the fires. Short gown or simple jacket. Short gowns are of basic construction and pin down the front. Simple jackets are more fitted and lace down the front with tape or grosgrain ribbon. 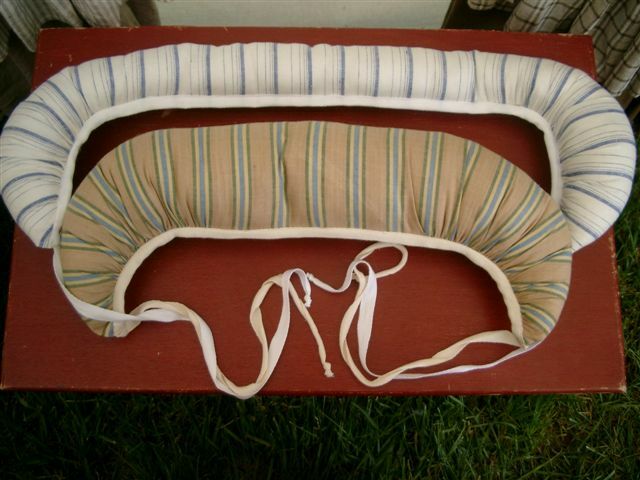 A belted bed jacket may also be worn. 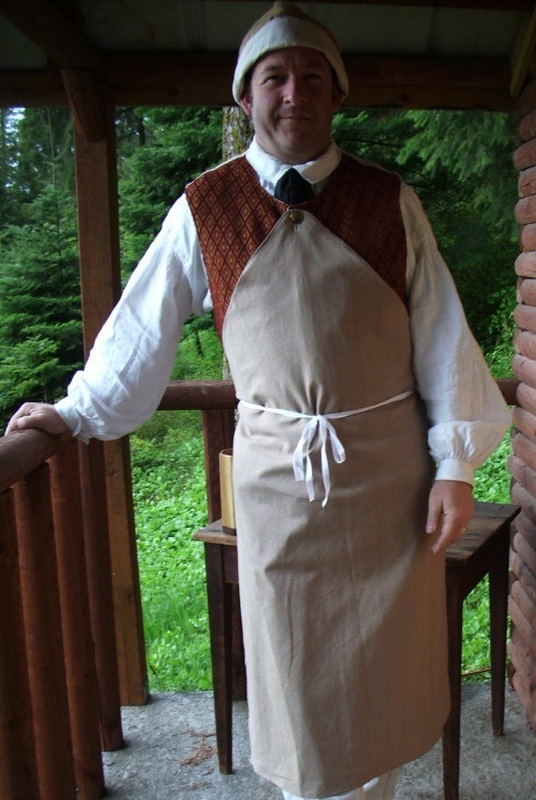 Linen apron - simple or bibbed. 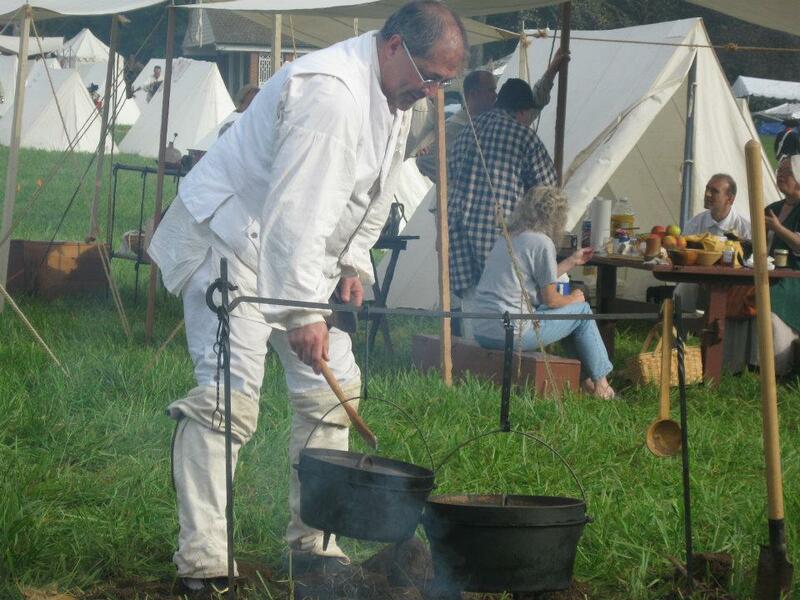 Undress aprons used at camp should only be made of linen for safety near the fires. Shoes. Colonial period shoes, either flat straight last or small heeled. Shoes may be rough out or smooth leather, tied or closed with a buckle. Cap. Most colonial women wore white linen caps to cover their hair, especially during the day. 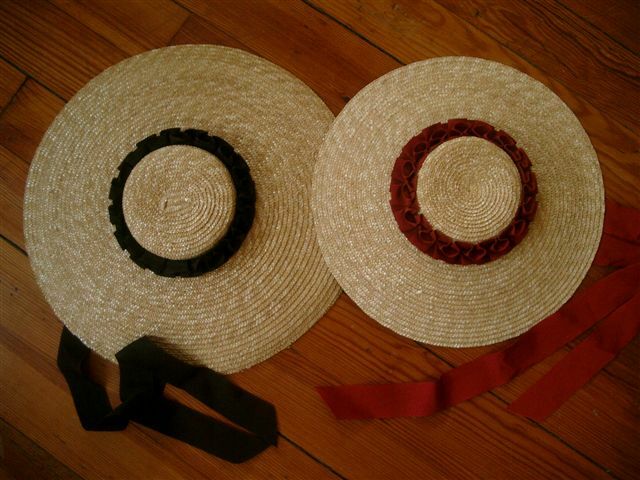 Wearing caps does not appear to have been common practice among Spanish women who, instead, generally wore their hair twisted up with a comb and covered their heads with a mantilla of lace or light-weight fabrics. When at day work, many Spanish women tied scarves around their heads, similar to snoods. Criollos of color might wear scarves tied as turbans to cover their hair. Cap laplets varied from country to country and from region to region. Cap laplets often denoted one's origins. 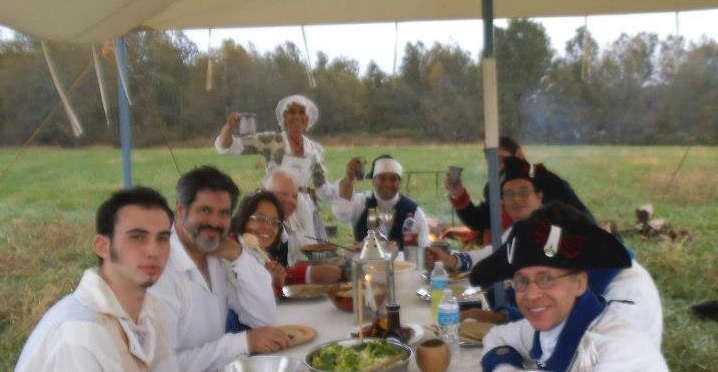 As Spanish Louisiana was populated by people from Spain, France, Arcadia, Germany, Ireland, the Caribbean, Hungary and many other countries, it would be acceptable to wear almost any cap in the Spanish Louisiana camp. Straw hat. Whether you wear a cap or tie your hair up with a scarf, a straw hat is recommended to protect your skin and eyes from the sun. Casaquin. A short jacket, about mid-hip, with a flared skirt and pleats at the back. The back is fitted, like a robe à l'anglaise three-quarter length sleeves and a hooked stomacher that laces across the front. The casaquin, or short jacket, is generally made of cotton, but may also be made of linen. Caraco. A long-length jacket with a fitted back, like a robe à l'anglaise The length of the skirt of these jackets is about mid-thigh, and the skirts usually have inverted box pleats at the back, often pressed but sometimes left loose. Caracos typically have three-quarter length sleeves with cuffs and/or cuff ruffles. Caracos close in severals ways, but the most common (and most comfortable) closes with edge to edge hooks in the center front. The Caraco skirt may be worn down or swagged. Caracos are commonly made from cotton or linen. Day gown. Full length jacket with flared skirt. The back is fitted, like a robe à l'anglaise, and has three-quarter length sleeves, with or without cuffs and with or without cuff ruffles. Gowns lace across the front and have pinned stomachers that may be worn under or over the lacing. The skirt may be worn down or swagged. 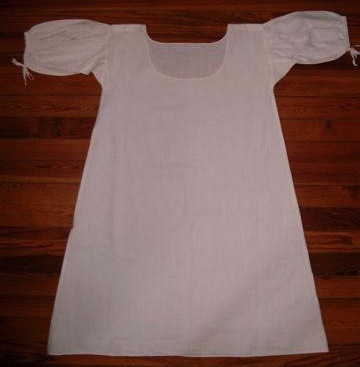 Day gowns are commonly made from linen or cotton. Casaquins, caracos and day gowns are worn with petticoats specifically made for wearing over foundations that must be worn with the jackets or gown. Casaquins and Caracos require wearing a rump roll and gowns require wearing "hips". The foundations are worn tied around the waist under the petticoat and create the proper shape to accentuate the design of the jackets. A civilian man might be a sutler or tradesman offering wares and services to the military or a gentleman visitor. Civilian men's attire in camp is determined by the persona being portrayed. Civilian men's under garments are similar to the soldier's under garments. 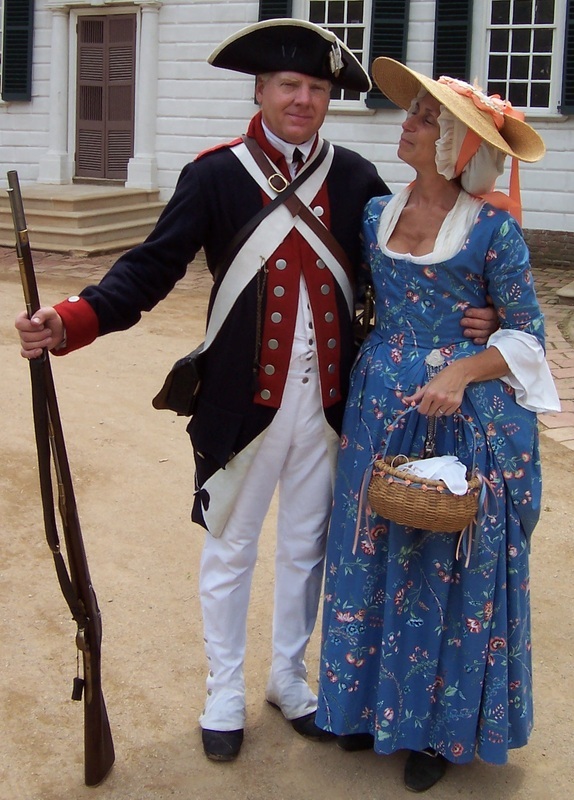 Civilian clothing offers more options for fabric colors and patterns, such as using checks and stripes for shirts and colored linens or wools for breeches, waistcoats and coats. Shirt. A linen mens shirt, color and weave pattern optional. A simple white linen shirt is always acceptable. For a gentleman impression, the shirt may be of a finer linen or cotton and ruffled. Stockings. Stockings can be of any color, cotton, wool or silk. Stockings are generally plain, especially if portraying a common man or tradesman. For a gentleman impression, stockings may be embellished with embroidery. Black leather garters or woven tapes used under the knee to hold stockings in place. Underdrawers. The primary male undergarment is the knee-length shirt. Although not well documented, there is some evidence that some men also chose to wear underdrawers. Made of linen or woolen flannel, underdrawers are always white and knee-length. Underdrawers serve as a separate lining for breeches, provide an additional layer of warmth and aide in preserving the breeches. Waistcoat. Sleeved or sleeveless waistcoats were generally worn. Waistcoats may be made of linen or summer-weight wool in a variety of colors and weave patterns. For a gentleman impression, the sleeveless waistcoat may be embellished with embroidery; made of silk or brocade; or trimmed with silver or gold lace. Breeches. Linen, cotton canvas, or wool breeches of any color or pattern. 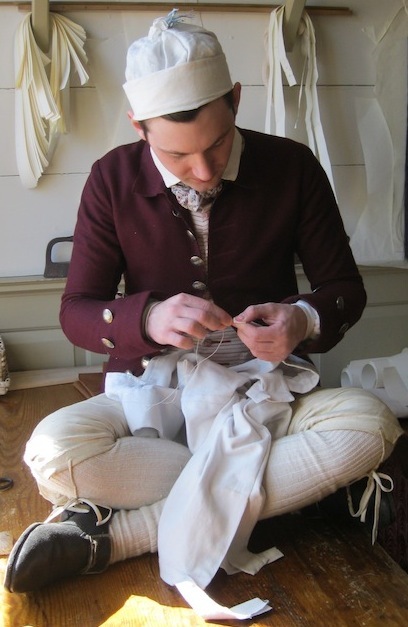 Dark colors, such as browns and blues, were often used colors for a working man's breeches, but white was also worn. For a gentleman's impression, breeches may be made of a variety of colors and fabrics and may be embellished with embroidery. Trousers. Trousers are worn by middling tradesmen, laborers, sailors, and slaves. Trousers are generally cut with a straight leg and worn to the ankle or slightly shorter. As trousers are utilitarian garments, they are mostly made of durable linens. Coat. 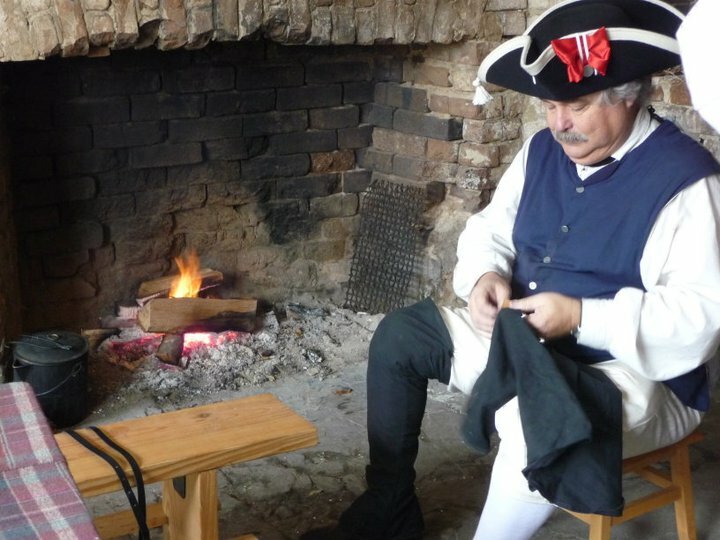 A coat is the uppermost layer of the 18th century man's suit, worn over a sleeveless waistcoat and breeches. The coat has narrow skirts with set in pleats, sleeve cuffs and may or may not have a small rolled collar. Coats may be made of linen, wool, cotton, brocade or silk, depending on the impression. Most coats are linen lined regardless of the fabric used for the coat itself. A coat is not worn with a sleeved waistcoat. For a gentleman impression, the coat may be embellished with embroidery or other elegant trims. Shoes. Plain black, low heeled shoes with brass or silver buckle. Neck Handkerchief. The most informal sort of neckwear generally worn by sporting gentlemen, working tradesmen, and laboring slaves. 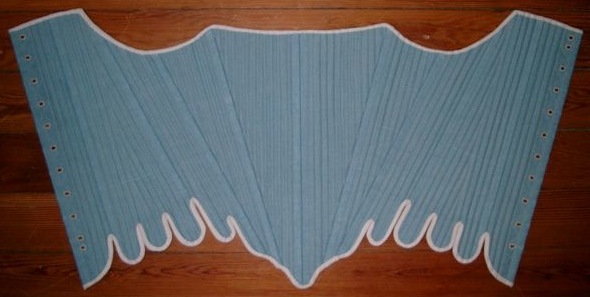 It is commonly a square folded and tied around the neck and is generally constructed of linen, cotton, or silk. Fabrics can be white, other solid colors, woven checks and stripes, or printed patterns. Cravat. A narrow length of white linen that can be adorned on its ends with lace, fringe, or knots. It is worn wrapped about the throat and loosely tied in front. Neck Stock. A stock is often a gentlemen's most formal neckwear. In fashionable dress it is universally made of fine white linen, pleated to fit beneath the chin and buckles behind the wearer's neck.